At 10:00 a.m. on May 20, 2013, the Bergen County Zoo opened the doors of its newest exhibit: Australia and the South Pacific. Featuring kookaburras, tortoises, and a host of other exotic creatures, this exhibit has been in the works since early September 2012. Because animals would be featured that had never been exhibited at the Bergen County Zoo, animal care staff had to figure out which animal species were available from other zoos, what their dietary and husbandry needs were, how much space and what type of exhibit each species needed, and how many individuals would be needed to exhibit the animals in the most natural way. Australia and the South Pacific houses animals that are uncommon in most zoos. 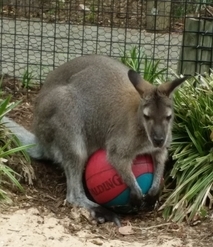 Four wallaroos, two grey and two red, are a prominent fixture of the exhibit. The name of the wallaroo species is a combination of "kangaroo" and "wallaby." The name often leads to confusion; the wallaroo is not a hybrid wallaby-kangaroo, but are a separate species of macropods, or large-footed animals, found throughout Australia. A male Chameleon forest dragon, an elusive species kept by a few U.S. zoos, enjoys his home in the exhibit as well. Much like his compatriots, the wallaroos, the chameleon forest dragon's name is also misleading. Our scaly specimen is an agamid, commonly called a "dragon," but not a chameleon at all. These reptiles share a lifestyle similar to chameleons, and hence are named after them. Found in the dense, humid forests of the South Pacific, chameleon forest dragons subsist mainly on earthworms. While designing the exhibit, the zoo wanted to exhibit and educate zoo-goers on endangered and critically endangered species. Australia and the South Pacific is home to four brush-tail bettongs. Bettongs are small, nocturnal rodent-like marsupials that once thrived across Australia, though their population has severely declined over the past 100 years. Now only an estimated 5,600 are left in the wild. Their main threats are the non-native red fox, feral cats, and pesticide exposure. In April 2013, the zoo discovered a surprise early one morning; a small furless leg was sticking out of the pouch of a bettong. Affectionately nicknamed Quigley, this young marsupial has since outgrown his mother's small pouch, and can be seen on exhibit. Anderson's alligator newts, another endangered species featured in Australia and the South Pacific, were once endemic to Japan and Taiwan. This species, no longer found in Taiwan, currently only inhabits a small remote, mountainous area of Japan. The main threats to these amphibians are habitat loss. Unlike other amphibians that lay hundreds of gel-like eggs in or near water, alligator newts lay single eggs under fallen leaves on land.